KANDAHAR, Afghanistan (9/7/2011) – Warhorse Brigade mourns the loss of one of our own, who was killed Sept. 3 while conducting a dismounted patrol with Afghan uniformed police partners in Kandahar City. Spc. Christopher John Scott, a 21 year-old native of Tyrone, N.Y., was assigned to 561st Military Police Company, 716th MP Battalion, attached to 1st Squadron, 10th Cavalry Regiment, 2nd Brigade Combat Team, 4th Infantry Division while deployed. Scott enlisted in the U. S. Army in July 2009 as an military policeman and was stationed at Fort Campbell, Ky. He earned the Air Assault Badge in April 2010. He deployed to Afghanistan in July 2011 in support of Operation Enduring Freedom 11-12. “I never met anyone so excited to serve their country and do what we were trained to do taen he,” said Spc. Daniel Osieczanik, an MP with the 561st MP Company. 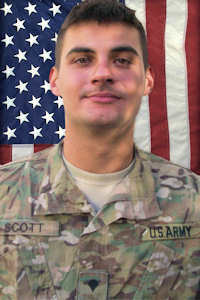 A memorial in Scott's honor was held in southern Afghanistan, Sept. 7. Scott was posthumously awarded the Bronze Star, Purple Heart, National Service Ribbon, and Combat Action Badge. Scott is survived by his parents Kenneth and Tammy Scott, his two brothers Mike and Daniel Scott, and his fianc� Tori.